Andy Murray will face 6ft 8in South African qualifier Kevin Anderson in the Australian Open first round in his quest for a first grand slam title. Defending champion Rafael Nadal and US Open winner Juan Martin del Potro could block the Briton's path to the final. Roger Federer is in the other side of the draw with Novak Djokovic and in-form Russian Nikolay Davydenko. In the women's draw, wildcard Justine Henin avoided a seed, but could face Kim Clijsters in the quarter-finals. There will be no all-Williams final as Venus and Serena landed in the same half of the draw. World number one Serena will face Urszula Radwanska of Poland in her opening match. Britain's two entrants Elena Baltacha and Katie O'Brien both drew opponents below them in the world rankings. Baltacha will meet France's Pauline Parmentier, while O'Brien was drawn against Austrian Patricia Mayr. O'Brien said: "I haven't played her before but we're the same age and I remember playing under-14 events with her. I haven't seen much of her since then but she re-emerged last year with some good results." 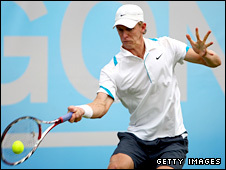 Baltacha stated: "I don't really know that much about Parmentier, but I'll make sure I'm well prepared. I'm ready to go." Henin, 27, is preparing to play her first Grand Slam tournament since the 2008 Australian Open after 20 months in retirement. She will meet fellow Belgian Kirsten Flipkens in the first round, before a possible meeting with world number five Elena Dementieva. While Henin was the name the top players were hoping to avoid in the women's draw, all eyes were on Murray in the men's. 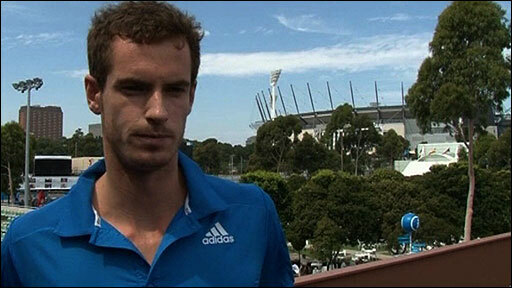 What are your predictions for the Australian Open? He dropped from fourth to fifth in the world rankings before the seedings were announced, and that meant Federer, Nadal, Djokovic or Del Potro could face the 22-year-old Scot as early as the quarter-finals. Friday's draw means Murray may have to beat Nadal, Del Potro and Federer in successive matches to win his maiden Grand Slam title. "If you get to the quarter-finals you're going to have to beat the best players anyway," he said. "Maybe it will be one more than normal but you're banking on the top four seeds getting to the quarter-finals and you never know. "There are always some surprises in there and I need to make sure I get there myself first." Murray will face Anderson, the world number 147, in the first round, an opponent he has never played before. The giant South African earned his way into the main draw after beating Germany's Simon Stadler 6-2 6-4 in the final round of qualifying. Murray's match is scheduled to be the third match on the Rod Laver Arena on Monday, with live coverage on BBC2 from 0330 GMT, Red Button and the BBC Sport website. If Murray overcomes Anderson he will come up against Marc Gicquel or Simone Bolelli, with Jurgen Melzer seeded to meet him in the third round. Murray may have to beat the dangerous Gael Monfils if he is to get beyond the fourth round for the first time in Melbourne. Del Potro could face Marin Cilic at that stage before a possible quarter-final against Andy Roddick. Nadal will open the defence of his title against Australian Peter Luczak, while Federer could face an early test against world number 36 Igor Andreev. Davydenko, who has beaten Federer in their last two meetings, could lie in wait for the world number one in the quarter-finals. Djokovic, the 2008 champion, meets Spain's Daniel Gimeno-Traver. Fourth seed Del Potro, who withdrew from the Kooyong Classic on Thursday with a wrist injury, is due to meet 31-year-old American Michael Russell. The Argentine is set to play at Melbourne Park despite the injury, according to Australian Open tournament director Craig Tiley. "He decided to take a couple of days' break," Tiley told Australian state radio. "He obviously wants to start 2010 well." Meanwhile, 15th seed Gilles Simon has been forced to withdraw because of a knee injury. The Frenchman, who reached the quarter-finals last year, has been struggling with the injury to his right knee since last year's French Open. Elsewhere in the women's draw, last year's beaten finalist Dinara Safina could meet fellow Russian Maria Sharapova in the fourth round. Clijsters was drawn against a qualifier in the first round, but world number three Svetlana Kuznetsova looks likely to be her first test in the last 16.